High fashion hits Deep Ellum with the boutique's arrival. Blank Canvas doesn’t look like anything you’ve seen in Deep Ellum before. Occupying a lofty 2,500-square-foot space along Main Street, the newly opened boutique showcases artwork, high-end home accessories, beautiful bespoke shoes, and fashion from emerging British brands—most of which are new to Dallas. 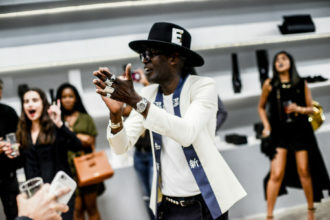 The store’s international atmosphere comes from its founders, Fode Sylla and Ladislas Mande. Sylla hails from Senegal and lives in London, while Mande, who grew up in Paris, recently moved to Dallas. Both men have been in the retail industry for years, curating and designing for European showrooms and brands. Their partnership began after meeting at the 2016 Liberty Fairs Trade Show in Las Vegas, and the relationship has deepened quickly. “He’s my mentor,” Mande says of Sylla. Mande has had the name Blank Canvas in his back pocket for a long time, he says. But the idea for the store wasn’t fully realized until the duo saw the Deep Ellum space, formerly occupied by Akola Project. 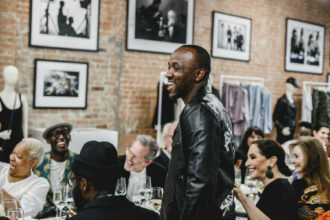 Warm Reception: Founders Fode Sylla (left) and Ladislas Mande (right) celebrated the opening of the Deep Ellum shop in April. Garments from Barcelona-based Gabriela Coll, silk robes from Copenhagen’s All at Sea, and delicate designs from Cecilie Bahnsen, a current finalist for the prestigious LVMH Prize, make their Dallas debut on the racks along Blank Canvas’ brick walls, mingling with more established names such as Comme des Garçons and Phoebe English. In keeping with Deep Ellum’s rich artistic history, the space also serves as a gallery. Currently on view are black-and-white photos of David Bowie, Blondie, and Elvis from London’s Rockarchive. It’s a different approach, but the Blank Canvas team is confident that locals will embrace their more avant-garde choices. “People in Dallas, when they see something good, they embrace it right away,” Mande says. “That’s what sets it apart.” 2646 Main St. 214-514-6700.